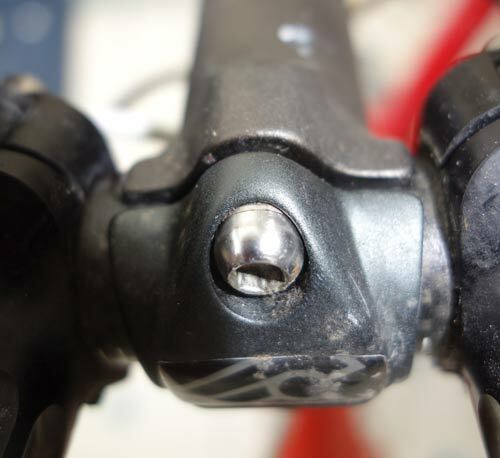 When trying to fit the new stem, I found great difficulty in putting the bolts in straight. I could have done with another pair of hands. The problem was it was very difficult to tighten up the four screws at equal angle. The stem kept slipping. Also, the spacers aren’t perfect. It means it felt like a botched job. I ended up screwing in one screw at a slight angle, it was a lot of resistance and then I saw I was shaving off some metal because it wasn’t going in straight. You can just see the metal shavings in the top picture. 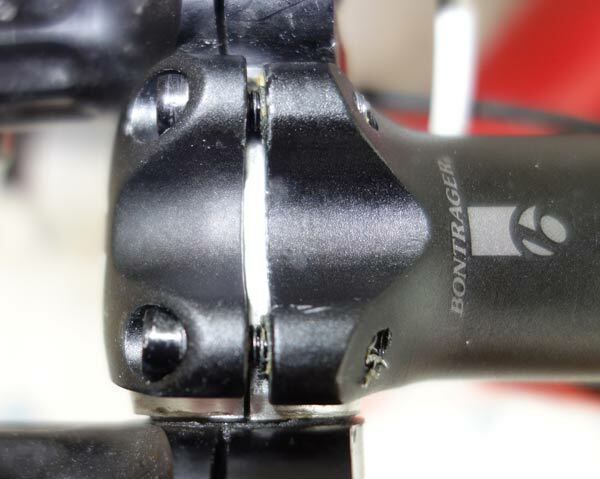 It was actually better alignment than the initial stem which broke. But, I didn’t like it. After the one ride, I threw away the stem. I’ve now put on an old stem I’ve found – which is the classic standard size. It is just two bolts and it was much easier to fit. No messing around with spacers either. It was much easier to screw in the screws straight, and there is equal distance between top and bottom. Therefore, I’m confident I have a good solid stem now. I could have waited to get back to Oxford to find my old stem and missed a days training. It ended up being £14.99 for one 30 mile training ride. But, £14.99 not to miss a day’s training is probably better value than £14.99 spent on improving your bike. Fitting a stem should be a relatively easy bike maintenance job. But, even this can be botched up and cause problems, if you’re not careful. Mixing sizes of standard and oversize are problematic. Spacers are OK, but it’s best not to mix unless you really have to. Different stem sizes are a real pain. I once got in difficulties because a handlebar was 26.0 and the stem 25.9. A torque wrench helps do a better job. But, the problem here was not lack of a torque wrench, but a failure to tighten bolts at exactly right angle. The new ‘oversize’ is 31.8mm. This is becoming default size, apart from a few specialist road handlebars. 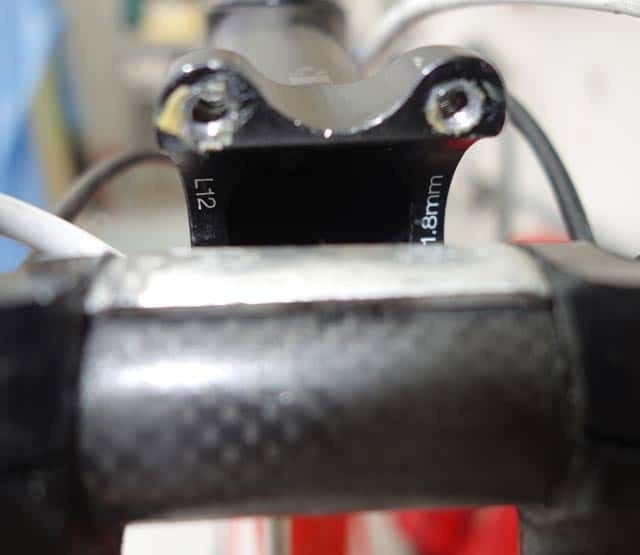 A more recent standard is a 31.8 mm (1.25″) clamp for both MTB and road bars. Good grief, it sounds absolutely shambolic, what speeds did you say you time trial at. Did you put any anti-seize compound on the screw threads.